Milwaukee-Downer College was a pioneering women's college in the Midwest, with roots dating back to the 1850s. It was formed in 1895 with the consolidation of two women's colleges: Milwaukee College and Downer College of Fox Lake, Wis. Milwaukee College had been founded in 1851 as the "Milwaukee Normal Institute and High School," with the guidance of Catharine Beecher, a leading proponent of women's education. Wisconsin Female College was founded in Fox Lake in 1855; its name was changed to Downer College in 1889 in honor of trustee and benefactor Judge Jason Downer. Ellen C. Sabin, who began as Downer College's president in 1891, went on to serve as the president of Milwaukee-Downer College until 1921. During her tenure, Milwaukee-Downer established one of the first occupational therapy programs in the country. Sabin was succeeded by Lucia R. Briggs, who served as president until 1951. Like Sabin, Briggs valued and advocated for the balance of a broad liberal arts curriculum with components of practical, professional training. John B. Johnson was the third president of Milwaukee-Downer College, serving from 1951 to 1964. Johnson's leadership included increasing the number of men on the faculty and initiatives to boost declining enrollment. In 1964, Downer's 43-acre eastside Milwaukee campus was sold to the University of Wisconsin-Milwaukee and 49 female students and 21 faculty members transferred to Lawrence. Forty-four of the original 49 Milwaukee-Downer students eventually earned bachelor's degrees from Lawrence, and 11 of the faculty members remained at Lawrence until retirement. Today Lawrence counts nearly 1,000 living Milwaukee-Downer graduates among its alumni. Many items of historical and sentimental value from Milwaukee-Downer now reside on Lawrence's Appleton campus, including the sundial from Merrill Hall, which was moved to the south side of Main Hall, and the Teakwood Room from Chapman Memorial Library on the Downer campus, which was dismantled piece-by-piece and reassembled in Jason Downer Commons, now Alice G. Chapman Hall. The Chapman Library's rare book collection, along with a selection of Downer memorabilia, is housed in the Milwaukee-Downer Room of the Seeley G. Mudd Library. A beloved grove of Hawthorn trees, known as Hawthornden, has been recreated near Colman Hall. And Lucia R. Briggs Hall was dedicated in 1997 as the home of Lawrence's mathematics and social science departments. In addition, several Milwaukee-Downer traditions have taken root at Lawrence. The assignment of class colors - red, yellow, green, or purple - originated at Milwaukee-Downer. In recent years, students have organized variations on Downer's famed Hat Hunt. Lawrence's crew team can claim a strong heritage in Milwaukee-Downer's rowing program, started in 1895. Most importantly, Milwaukee-Downer's legacy strengthens our commitment to liberal education for all, with equal opportunities for women. The LU Archives houses a large set of collections documenting Milwaukee-Downer College - almost 200 boxes, plus 300 bound volumes of material - that are open for research. These collections include a set of college records that was transferred to Lawrence with the consolidation, files documenting people and subjects associated with Milwaukee-Downer, and a number of scrapbooks and personal papers collections that have been donated to the Archives since the consolidation. Another large collection of Milwaukee-Downer’s records is owned by the Wisconsin Historical Society and held at the University of Wisconsin-Milwaukee Archives. A full description of these materials is in ArCat, the WHS Archives catalog. Digital collections of Milwaukee-Downer College material include written histories of the College, oral histories with alumnae, and a selection of photographs. Click here to download Ron Tank's copy of The Consolidation of Milwaukee-Downer College and Lawrence College. 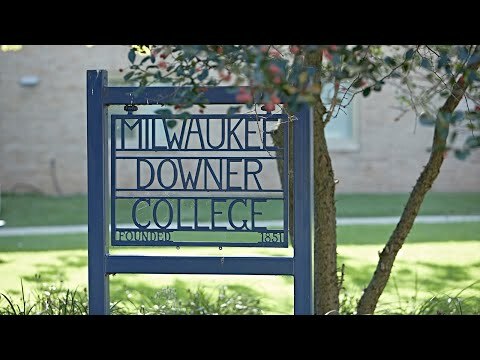 This 19-minute film produced in 2010 explores the Milwaukee-Downer legacy at Lawrence and includes interviews with Milwaukee-Downer alumnae.